The PS4 Pro has all the features of the much-loved PlayStation 4 but is designed to make your games come to life with incredible graphics and large storage. For the hard-core gamers, this is the ultimate console for you! The new and improved specs make this one of the most powerful consoles in the market and you can be sure to enjoy a next-level gaming experience when using the PS4 Pro 1TB. The PS4 Pro features double the GPU of a standard PlayStation 4 resulting in the system running smoother and faster than ever. Say goodbye to the buffering symbol and hello to quicker loading rates because the PS4 Pro helps your games run seamlessly and effortlessly. Watch your games come to life in your living room with the advanced 4K technology that creates a crisp and clean image. The high-resolution display is perfect for those with a HD TV or 4K TV where the quests and adventures will be right in your living room with you. The PS4 Pro is an impressive upgrade to the PlayStation 4 with better graphics and quicker loading time. The 1TB storage means you are free of limitations and save all your favourite games on the one console. You can get more out of your games and dive into a new experience with the PS4 Pro. Ps5 next year most likely, probably best holding off if you don't have a …Ps5 next year most likely, probably best holding off if you don't have a Ps4 Pro already. So I have been hearing since 2016. Ps5 next year most likely, probably best holding off if you don't have a Ps4 Pro already. I have the new quieter one after having one that sounded like a jet engine and boy its wonderful. Small pleasures. 72xx is referred as Gamma chasis AFAIK. It's difficult to tell, 7216b has been popping up for months on deals from here that are not RDR2. What's the difference between the chassis? 7216b is the quieter one as if you Google you will see people complaining older versions can sound like a jet engine. I've got the 2716b and was worried but mine is as quiet as my regular PS4 was and can hardly hear it. I have the new quieter one after having one that sounded like a jet engine …I have the new quieter one after having one that sounded like a jet engine and boy its wonderful. Small pleasures. Does it not run hotter though? How do you tell the difference in the chasis using the name? 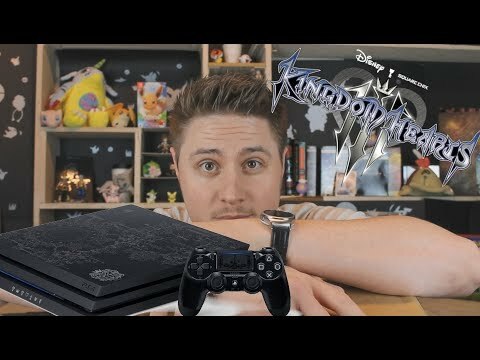 What about the kh3 limited edition console? Mine is cool on top but it gets hot air coming out the back, i can't say if it is hotter or not than my old PS4 but i have been playing God of War on it lately for long hours in 4Kish mode and there hasn't been any issues with that or any of my other power hungry games. The true test will come in the summer but for now i consider it to be a perfectly running silent PS4 Pro that even my partner doesn't complain about and she can hear cat ultra sonics, spiders walking along the skirting board and a pin drop, so if the sound passes her hearing test then i am happy. Saying all that if you do a Google you will still get people complaining about it. From this link i get CUHJ-10025 in Japan, CUH-7218BBZQX in Asia, CUH-7216B in Europe, CUH-7215B in North America, so all good. But do you really want a version of the console with a horrible glossy controller, that would be a nightmare with greasy fingers, you can see how bad it is from this video at 2mins. Be a bit silly to believe it that early on since the consoles tend to live for atleast 6 years. Then the ps4 pro came out to add more life into it. 2020 sounds reasonable enough, maybe early 2021. especially since Microsoft is releasing even more xbox consoles later this year/next year. My thoughts exactly, although that's some time away. Info is either, vague, speculation or fake. There's something to be said for being an early adoptee. Odds on we probably will see the PS5 next year (most likely towards the end of it), though I'm still looking to upgrade to a Pro, as even though I don't have a 4k TV, I want it for the performance increase in VR. I am waiting until it's sub £300 though. Odds on we probably will see the PS5 next year (most likely towards the …Odds on we probably will see the PS5 next year (most likely towards the end of it), though I'm still looking to upgrade to a Pro, as even though I don't have a 4k TV, I want it for the performance increase in VR. I am waiting until it's sub £300 though. You could easily sell your regular Ps4 for about £100-150 if that helps. That's what I did to justify the cost when they first released. But I did have a 4K TV ready to go with it. I won't be diving in on the initial release, i will give them time to iron out the problems with it, 1 to 2 years is along time to hold off waiting. I won't be diving in on the initial release, i will give them time to iron …I won't be diving in on the initial release, i will give them time to iron out the problems with it, 1 to 2 years is along time to hold off waiting. Wish I could. I'm way too into gaming to hold off buying a new console. Yes, I have a Ps4 Pro, Xbox one X, Nintendo Switch and a Gaming PC. Yes, I have a problem. But.... games. Wish I could. I'm way too into gaming to hold off buying a new …Wish I could. I'm way too into gaming to hold off buying a new console.Yes, I have a Ps4 Pro, Xbox one X, Nintendo Switch and a Gaming PC.Yes, I have a problem. But.... games. @ArcAndPie what's your opinion on this? I recently bought a gaming pc and so far loving playing esports type games on it. I'm running on a 23" 1080p monitor atm overclocked to 83hz. I'm not sure what to do for other kinds of games, games with pretty graphics/single player games. Either I look at upgrading my GPU and buying a 1440p 27" IPS monitor to play all kinds of games with, or I buy a PS4 Pro (or PS5) and play those kinds of games on a 4K 65" TV. In that case I'd probably get a 144hz TN monitor and continue to play e sports games on the PC. What would you say would be the better experience overall? @ArcAndPie what's your opinion on this? I recently bought a gaming pc and …@ArcAndPie what's your opinion on this? I recently bought a gaming pc and so far loving playing esports type games on it. I'm running on a 23" 1080p monitor atm overclocked to 83hz. I'm not sure what to do for other kinds of games, games with pretty graphics/single player games. Either I look at upgrading my GPU and buying a 1440p 27" IPS monitor to play all kinds of games with, or I buy a PS4 Pro (or PS5) and play those kinds of games on a 4K 65" TV. In that case I'd probably get a 144hz TN monitor and continue to play e sports games on the PC.What would you say would be the better experience overall? Personally, I play single player games and online games vs AI on PC , as I am terrible with mouse and keyboard and only use a gamepad. I leave the competitive stuff to console. (I know, I'm awful!). Personally I would go for the GPU upgrade and 1440p monitor. I use a 1440p monitor and games look just as nice as 4K in my opinion. Obviously 4K does look better but when its next to each other it is rather similar. With that in mind, if youd rather go the big TV and console route, I really would reccomend the Xbox one X. It looks so much better then the Ps4 Pro, but Ps4 does have better exclusives in my opinion. TL;DR: Go GPU upgrade if prefer PC, or go Big 4K TV and Xbox one X. No, not at all, if anything its cooler. From where? The ps4 pro alone is £349.99 so for £10 more you get all the extras. From where? The ps4 pro alone is £349.99 so for £10 more you get all the e …From where? The ps4 pro alone is £349.99 so for £10 more you get all the extras. 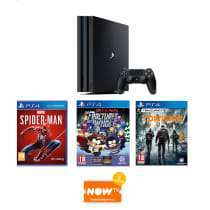 You can certainly get the PS4 and Spider-Man for £349. So it depends if you want the other two games for the extra £10. I just went to my local Game here in Hull and got the £350 spiderman with now tv bundle and can confirm it is the CUH 7216B model if that helps anyone. How exactly has this deal gotten so hot? It's not even a decent deal. I just went to my local Game here in Hull and got the £350 spiderman with …I just went to my local Game here in Hull and got the £350 spiderman with now tv bundle and can confirm it is the CUH 7216B model if that helps anyone. A lot of people have got rid of their old ps4 pro for the 7216b definitely worth it being the newer quieter model.